Step 1 Prepare the vegetables: If the potatoes are very small, leave them whole. If they are walnut-sized, cut in half. If they are larger, cut in bite-sized pieces. The carrots should be about as wide as a pencil. If the carrots are very thin, leave them whole; otherwise, cut them lengthwise in halves or quarters. Break the cauliflower into florets. Cut the onion in half lengthwise and then into thin slices crosswise and add to the pan. Separate the garlic into individual cloves, but leave them unpeeled. Step 2 Steam the potatoes in a tightly covered pot over boiling water until tender, about 15 minutes, then drain. Step 3While the potatoes are cooking, melt 2 tablespoons butter in a large saute pan over medium-low heat and add the onion and unpeeled garlic cloves to the pan. Cook, stirring occasionally, until the onions soften, about 5 minutes. Step 4Reduce the heat to very low. Add the carrots and cauliflower to the pan, season with 1 teaspoon salt and scatter the arugula over the top. Cover tightly and cook very gently, stirring occasionally, until the carrots are tender, about 20 minutes. The arugula should exude enough moisture, but if the pan looks dry, add a tablespoon or two of water or white wine. Step 5When the carrots are tender, transfer the steamed potatoes to the pan and stir gently to combine. Divide the remaining one-fourth cup of butter into 1-tablespoon chunks and add a piece or two at a time to the pan, stirring them into the vegetables to make a light sauce. Scatter the minced tarragon over the top and serve. In Recipes-list.com we have selected the most viewed recipes from category - Healthy eating Vegetables Vegetarian . Enjoy the best recipes specially selected for you! 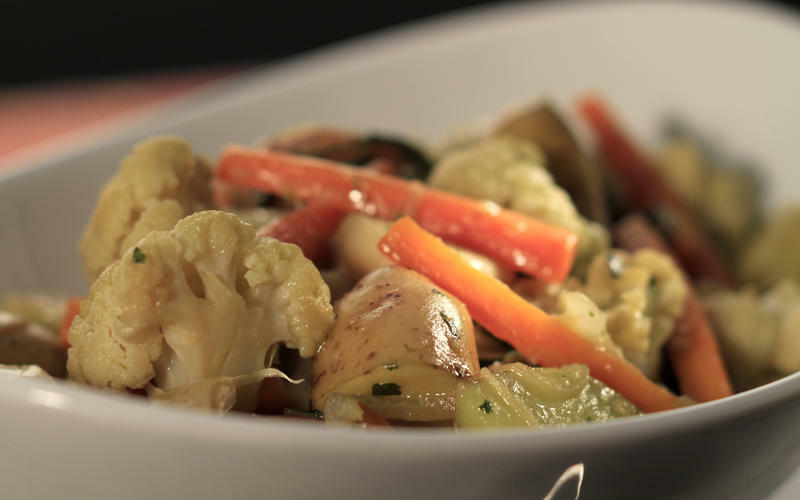 Ragout of spring vegetables is the right choice that will satisfy all your claims.